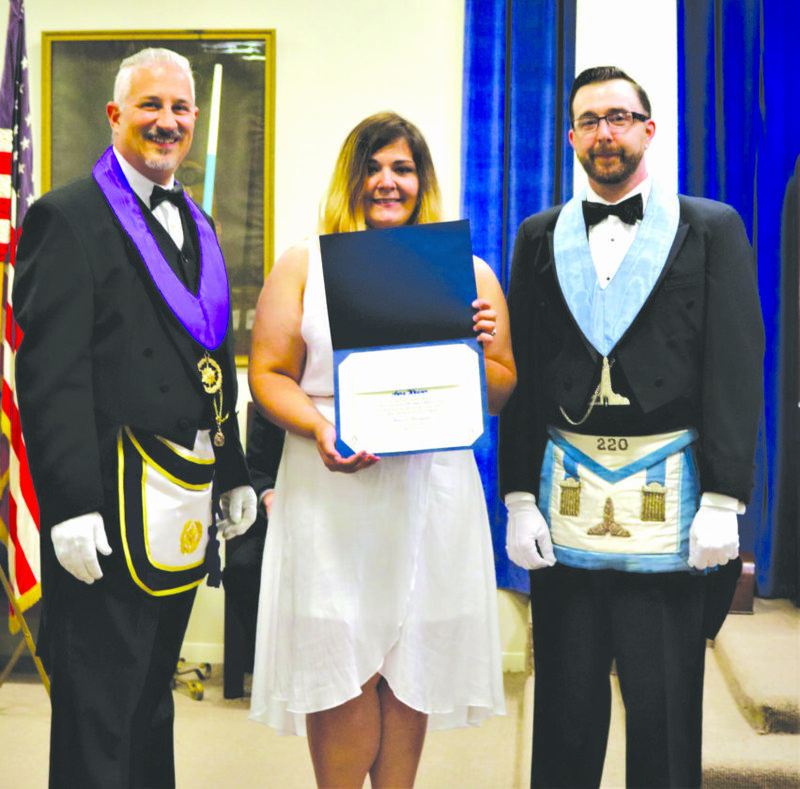 Courtesy photo Larry Bilotto (left), District Deputy Grand Master 20th Masonic District, presents a $1,000 Harold Greaney Scholarship from the Pennsylvania Masonic Youth Foundation to Aura Weaver of Altoona. At right is her father, Wayne Weaver, a member of Portage Lodge No. 220. Aura Weaver, Altoona, has been selected to receive a $1,000 Harold Greaney Scholarship from the Pennsyl-vania Masonic Youth Foundation. 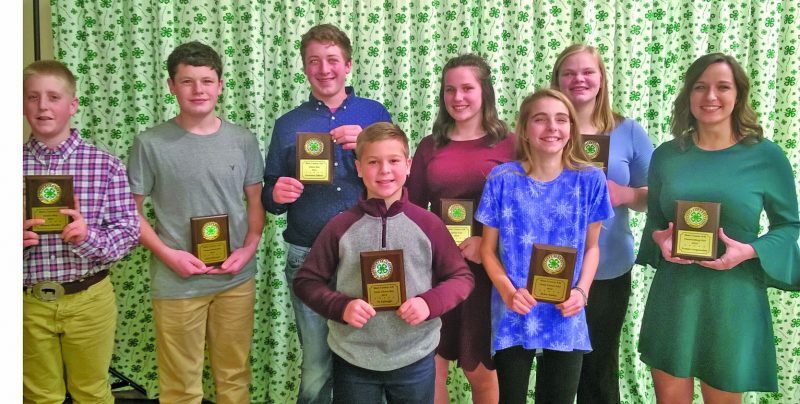 The foundation, a charitable extension of the Grand Lodge of Masons in Pennsylvania, presented 58 scholarships totaling more than $172,000 this year to young people with a Masonic relative, or who are members of a Masonic-sponsored youth group. Aura is eligible as a daughter of Wayne P. Weaver, a member of Portage Lodge No. 220. She was selected from 176 applicants for this scholarship. Aura will be attending Indiana University of Pennsyl-vania, as a junior with a major in biology. She graduated from Altoona Area High School in 2016. Swinging Squares, an Altoona modern western square and round dance club, will host a free “fun night” introduction to square dance the entire month of September. The public is invited to join the group from 7:30 to 9:30 p.m. Thursdays in September (Sept. 6, 13, 20 and 27) at the Jaggard First United Methodist Church social hall, 1801 Pleasant Valley Blvd., Altoona. No prior square dance experience is required; couples and single dancers of all ages are welcome for an evening of fun, fitness and friendship. For more information, contact Howard and Donna Williamson, club caller and cuer, at 742-7078 or Karen Koehle at 329-0410. Members of the Blair Garden Club will travel to the Arboretum at Penn State University on Monday. Members will explore the horticulture at the Arboretum and learn about new plantings at the site. A brief business meeting will begin at 5:30 p.m., after which members are free to go on a guided or self-guided tour. Carpooling is encouraged. 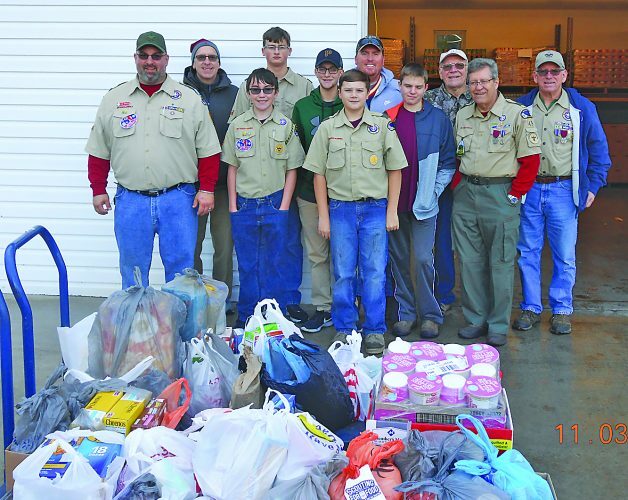 The Blair County Game, Fish and Forestry Associa-tion, 301 Riggles Gap Sportsman Road, Altoona, will hold its 80th annual Ox Roast Festival on Sept. 2 and 3. 3D Archery (30 target course) starts at 7:30 a.m. Sept. 2 and 3. Other activities both days include running deer, a handgun steel plate shoot, children’s games, sportsmen’s flea market, a .22 caliber shooting gallery, trap shooting, 5 Stand and new this year is a Blair Game Crap Trap shoot. Sunday bands include Asbury Lane at 11 a.m., Rokkandy at 1 p.m. and Borrowed Time at 3 p.m. Monday bands include Cousin Mike and Rick at 11 a.m. and The Backyard Rockers at 1 p.m.
Labor Day’s special activities include a field day of six events, which are .22 rifle, high power rifle, running deer, handgun, archery and disappearing bear. Food will include ox roast sandwiches and baked macaroni and cheese. There will be hay rides, bingo at 1 p.m. and lots of vendors. Admission and parking are free. For more information, call the lodge at 942-8522 or visit the group on Facebook or at www.blaircountygame.com. PATTON — Would you like to travel to different events or places but you don’t like to drive or travel alone? Then think about joining Patton’s Travel Club. There will be a general meeting at 7 p.m. Tuesday at the Patton Library. Those attending will start making a list of the types of trips people are interested in taking, as well as a contact list to keep people informed of upcoming trips.